Hitting Reply sends a message back to the person who sent the original, right? Not always. I'll look at how and why a Reply might actually bounce. I have received emails from several people but when I try to respond, the message gets kicked back as 'Permanent fatal errors' and 'Reason 550: user unknown' as an incorrect email address. I am using the email address that the message was sent with, so how can it be incorrect? Is there anything that I can do? You get a message back that your reply bounces ... how's that possible if you never even typed in an email address? You never had the opportunity to get it wrong - you just replied to the address it was sent from, right? There are two common scenarios that can cause this. But first, we need to talk about that "From:" address. "... the 'From:' line on an email is simply set by convention - it is not required to be the email address that the message came from ..."
Now, looking at that, you would assume that the message came from the person who's email address is "someone@somerandomservice.com". 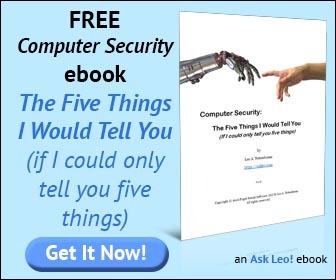 The big secret is this: the "From:" line on an email is simply set by convention - it is not required to be the email address that the message came from, and it's not enforced to be that by any email software along the way. Now, 99.99% of the time, it is in fact the email address of the sender because the sender wants you to be able to reply, and most email programs default to setting it that way. As I said, there are two common cases where it's not the sender at all. It's easy to set the "From:" address to whatever a spammer wants to set it to. In order to make it that much more difficult to track down spammers, they often set the "From:" address to be something completely unrelated to the email that's being sent, and most certainly not the email address of the actual sender. Frequently, spammers will set the "From:" address to another address on their list of addresses to spam. Reply to that spam and the person who gets that email might have no idea what you're talking about because they didn't send it. Or spammers might just make it all up - the From: address might not be valid at all. Reply to it and your message might bounce. This entry is only used as what will be placed in the "From:" line for emails you send. It may not have to be right. Here's the human error part: you'd be shocked at how often people mistype their own email address. I see it all the time in questions submitted to Ask Leo!. I'll reply with an answer and ... bounce. What that means is that all that had to happen was for the person who sent you that email to have mistyped their own email address when they configured their email client. The "From:" address would be invalid, and neither you, nor anyone else who received email from them, would be able to simply hit Reply and have it work. If you reply, it might bounce. The only thing that you can do is check the email that appears when you hit Reply and make sure that it's their correct email address, assuming that you know it. If you do, and note a difference, then type in their correct email address into the To: line instead. Of course, you may want to let them know that there may be a problem in their configuration. This is much more unlikely in day-to-day use, but I'll mention it for completeness as it could suffer from the same problem. There is an additional, optional, and often hidden email header called "Reply-To:"
This header is a specific override for the reply function. It indicates that when the recipient replies to this message, the reply is to be sent to this different email address. Naturally, it can be forged by spammers and mistakes can be made by those using it for legitimate email. In either case, the discussion is as above: reply and your message might bounce if the Reply-To header has an incorrect email address. Someone's sending from my email address! How do I stop them?! Email spoofing is rampant. Spammers often send email that looks like it came from you. And there's little you can do about it. How can I automatically reply to spammers telling them to stop and that I'm not reading their junk? How can I automatically reply to spammers telling them to stop and that I'm not reading their junk? While it is bad practice to put "do not reply" or "this address isn't monitored" kind of email addresses, I can sympathise with the reasons for doing so. Every time I send a newsletter I get flooded with out-of-office and other messages. Often "real" messages are simply lost in all that. That's why I strongly recommend people contact me only via the web forms and not via email. Reason 4, for unrelated reasons your ISP may be temporarily banned from the sender's ISP or by internal email rules because your ISP is seen as a source for too much spam. For instance, in Outlook, I can "shred" emails from toomuchspam.com -- but that's a whole 'nother topic. We email marketers differentiate from the "display" From line and the domain-name sender address. Most "email service providers"--the name for the companies that send out email for clients--allow one to create any display name they want, and we do, because the real sender address has no marketing value, and in fact can seem unfamiliar to many recipients (and therefore misinterpreted as spam). We will often use a recognizable company or product name in the display From line instead of the sender address. Readers will note that most commercial emails will in fact not display in the From line a real address, like xxxxxx@xxxxx.com, for the reasons above. Of course, spammers can do this too. Regardless, a reply to a legitimate commercial email--unless it's a no-reply email which usually states that point--will go the real sender address. If you do not see a message indicating no replies accepted, and your reply bounces, it's likely spam. But as explained in the article and comments, not always. 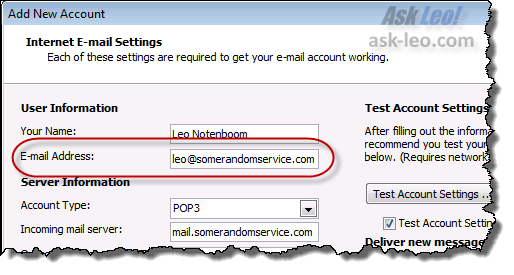 If you can figure out how to read the entire header, as Leo explained for Outlook 2010, you can see the full sender address, and make decisions accordingly. The real address must be in the header. Even so, the real address may be a spammer, ever harder to tell, even if the domain name appears in it. To "realist", many companies set up a special email address for sending out alerts to customers. These messages are not meant to be replied to, and there is no ulterior motive. These are simply not the venue for customer service for many reasons, one of which is that the whole process is automated and no human would be looking at replies if they were to be accepted. Almost always the email will provide information, often in the form of a customer service email address, for customer service. It's wrong to claim that this is done to deter customer contact--the last thing any reputable company wants! I haven't encountered this in a LONG time, but I've seen it happen with replies to emails from legitimate contacts. I never looked at the header, but all my emails from them were able to handle the Reply To in the past, and also were able to handle it again after a spate of problems for a few weeks. I'm only guessing, but my belief is that many email transmissions were being bounced in the early stages of fighting spam and ISPs were overzealous in their efforts. I'm wondering if current problems like this might still be happening with smaller or newer ISPs. I have what to me is a related problem concerning a free yahoo site which they are (have been for three months !!) looking into. The recipient using the REPLY button finds their reply bounces by virtue of a single duplicated character that is not obvious to a casual glance. I was put wise to it by a savvy contact who deleted the intrusive stow away. It is more of a management inconvenience than a true problem problem but you may know of a solution ? I am grateful for having the benefit of you techie wisdom at my ready elbow (I am an octogenarian). Pls help. I cant reply on my emails and cannot send messages, too. When I click send, the message go to drafts and say I need to include characters. What is that? Thanks. Would really appreciate your reply and solution to my problem.